Scuba diving is something I started doing about eight years ago. Mostly because I’ve always wanted to be a mermaid, but also because the allure of an underwater world is just too strong for this land-locked chick to resist. When I decided to spend some time living in Belize, I quickly targeted the island of Ambergris Caye for its convenient proximity to a million and one magnificent dive sites all along the Belize Barrier Reef (the second-largest reef on the planet). Reading travel guides that gave accounts of incredibly diverse dive sites where everything from sharks and eagle rays to manatees, turtles, and dolphins could be seen was almost more than my (semi) mermaid heart could stand. So, one of the first things I did when I arrived on the island was ask around San Pedro town for suggestions on dive spots and reliable shops to go out with. A friend who had moved to the island a few months prior to my own relocation recommended the Dive Bar. She spoke highly of the staff and their competency levels, as well as the quality of the sites and the fair prices. Plus, I’m sure it doesn’t hurt that the establishment is literally located right next door to her home. For me, however, it’s a quick 30-minute bike ride from my south-side condo at the Grand Baymen Gardens, so I left my place around 7:45 AM. When I arrived, my friend was running on island time (aka late), so I sat at the already open bar and chatted with a few folks from around the area who were having breakfast. I decided I should also squeeze in a quick meal and ordered up a bacon, egg, and cheese English muffin breakfast sandwich—something that would certainly sustain me through both my dives. While I waited for my food to arrive, our Dive Master, Chino, fitted me out for my equipment. Everything was clean and organized and thankfully didn’t harbor the all-too-familiar mold scent that some used wet clothing can easily acquire. By then, my friend had found her way to us, and Chino continued his outfitting work with her while I quickly finished my tasty breakfast treat. Soon, we we’re settled on the boat and headed just off shore to our first dive spot, the Tres Cocos Canyons. After we anchored, Chino expertly strapped us into our dive gear and down we went into the deep blue sea. The first thing I noticed was that there were nurse sharks everywhere. 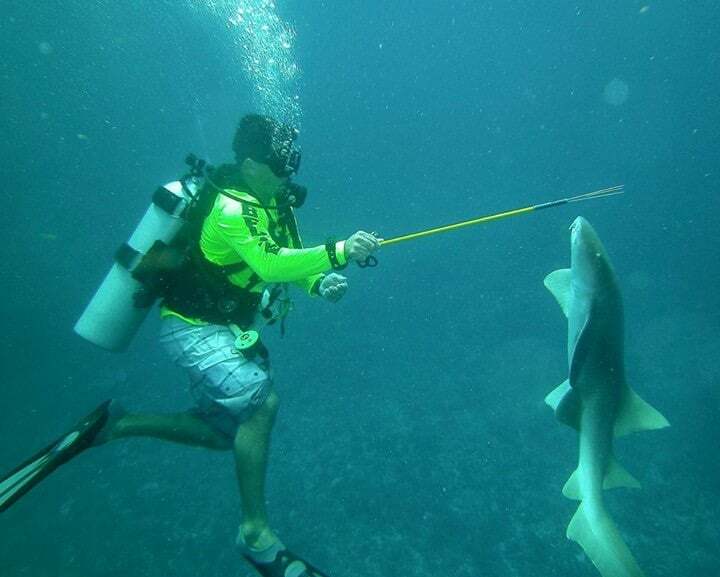 They’re supposed to be super friendly, and dive teams here spear fresh fish to feed them pretty often. They started to follow us as we drifted along the coral wall. At first, they made me nervous, not because I thought they’d hurt me, but because they have a tricky way of sporadically popping up beneath and behind you when you least expect it. And let’s be honest, that can be a little unnerving. Once I got used to their presence, however, I started to see an incredible amount of life among the coral. Fish of all colors swam in and out of holes of all sizes, nibbling at microscopic meals here and there. Our crew cruised along as Chino pointed out interesting coral, rare fish, and even a few sea urchins. Incredibly, right around the time our air levels indicated it was time to resurface, I spotted five dolphins swimming by. Excitement quickly overtook me and I banged on my tank until my fellow divers turned to see what the deal was. Although short-lived, it was a magical moment for us all, bringing tears to my friend’s eyes inside her goggles. Back on the boat, we shared stories of what we had seen as the boat brought us back to the beach for lunch. Anticipation for our next dive was high as we leisurely enjoyed our meal. Our second spot, Palapa Canyons, was another incredible event. We had one-hundred-foot visibility and swam at a shallow 70 feet between rhythmically swaying colorful coral formations. For me, the coolest sighting was certainly seeing a moray eel (my first ocean eel spotting). Again, I tried to get everyone’s attention, but by the time they all turned, the eel had disappeared back into the coral mazes from whence it came. Two small squid were also an amazing sight, slowly squirming their way through the salt water. Finally, as we surfaced back into the dazzling daylight, Chino stopped to show us how to make air bubble rings under the water (a difficult task to say the least).